(1958-1990), the American Pop artist who went from drawings in the New York subways stations to major museum retrospectives and whose images have become icons of the 20th century moved to New York in 1978 to attend the School of Visual Arts, where his original approach was soon apparent in graffiti-inspired style expanded into large-scale designs of generative energy. At the height of the Punk Rock movement in the late 1970's he participated in the lively New York club scene, working with other artists involved in the same movement such as Jean-Michel Basquiat. In the summer of 1980 he took up drawing, inventing intricate cartoon-style murals of mutant figures locked in hyper-physical engagement. He had become a star in American art during the 1980s, exhibiting and working on projects throughout the United States, Europe and Asia, and his work became a symbol of metropolitan life. His accessible imagery stems as much from Islamic and Japanese art as the sign language of contemporary culture. 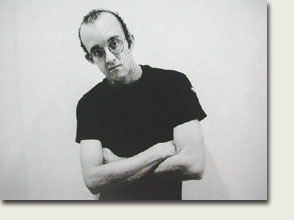 In 1986 the artist opened his own retail outlet, The Pop Shop, in New York and was continuously engaged in projects of an extraordinarily diverse nature, from murals on the Berlin Wall to paintings on hot air balloons, motor cars and decorative accessories.Keith Haring's art is bright, exuberant and widely embraced. The Radiant Baby is Keith Haring's most single famous image. Haring created icons of mass culture to which everyone could relate. Haring’s drawing deal with the life of everyman.